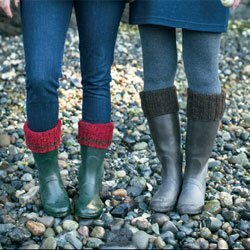 Yarn: ankle: 240 yds; short: 340 yds; tall: 460 yds worsted weight Ribbed from top to bottom, our woolly cuffs give you the look of thick cozy socks, but fit nicely into your boots. Smooth stirrups keep them seated. Worked in the round, boot cuffs are a nice, easy ‘warm-up’ before you tackle your first pair of socks.